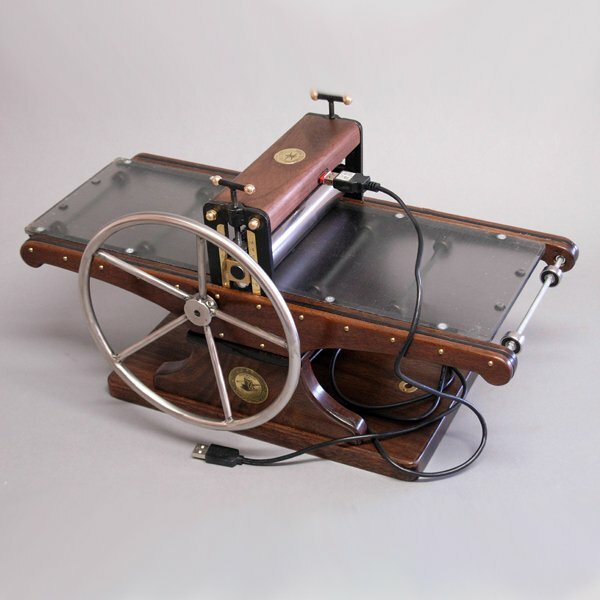 This table-top etching press is re-loaded with digitized etching data which is accessed by connecting the press to a computer. 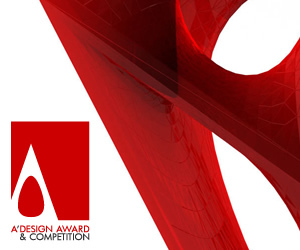 It is the winner of the Silver Award for Unexpected Design: A’Design Award. The Seattle-based Halfwood Project team showcased the fully functional hand-printing press designed for printing fine art etchings, reminiscent of old-world craftsmanship. A 21st Century feature, PressGhost, is included. 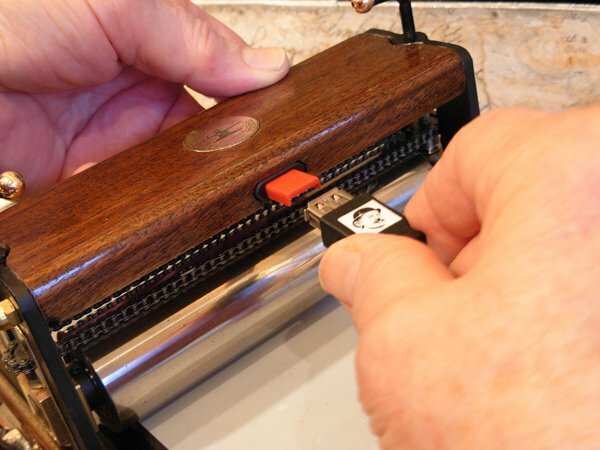 The inventor, Bill Ritchie, says it is “etching reloaded” in a flash memory drive in wood. 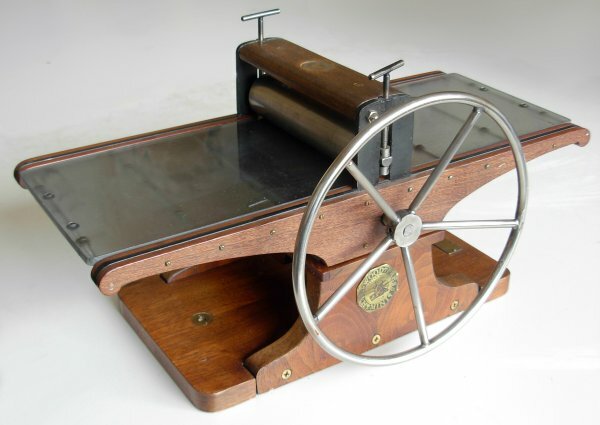 For the printmaking world, the PressGhost is unexpected! 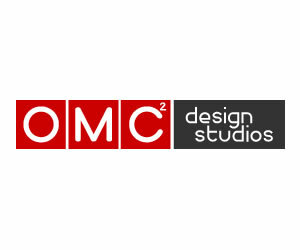 “To ‘reload’ etching is analogous to the way an old Web page on your computer is reloaded,” according to Ritchie, an art professor and the lead designer of the Halfwood Project. 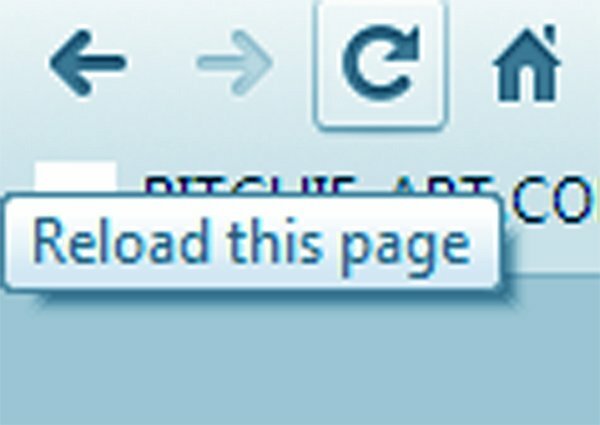 “’Re-loading’ the history of fine art printmaking is my objective—like the way new Web data replaces old data on your hard drive when you use the RELOAD THIS PAGE command.” Unlike hard copy, he can change, add to or delete digital data. To this professor—who has fifty years’ experience in fine art printmaking and education—that’s good news for design innovation and teaching. The data throughway helps artists and teachers to stay abreast of the times with information they can build on. Professor Ritchie was schooled in the ‘60s and taught college printmaking differently than the way he had been taught. 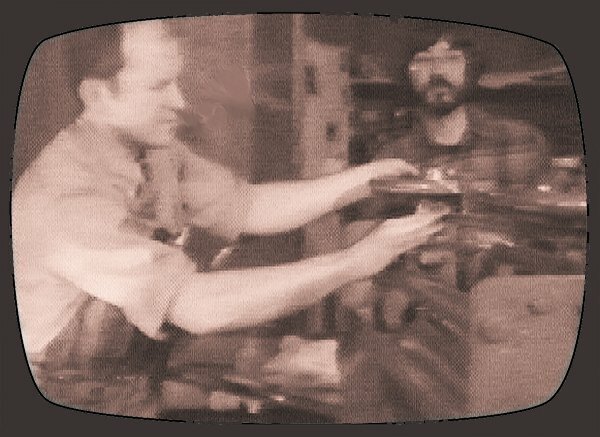 A 1971 teaching video shows how he started his career on an etching press in a typical college art studio—a machine as unattractive as it was heavy, weighing almost a ton. Ritchie believed smaller, lighter, and beautiful presses might be possible—and might also be made smarter. He observed that few students could afford to buy the machines they learned on; he saw that the art school curriculum was ossified and printmaking teaching needed to be “reloaded.” A trip to Europe to work with pioneering printmakers Rolf Nesch and S. W. Hayter gave him a craving for new techniques so he started mixing video with printmaking. From 1970 on, Ritchie’s videos disrupted art academe but art students were hungry for fresh ideas and new data. After fifteen years of developing multimedia for art and teaching, Bill left the UW for a better environment for creativity. 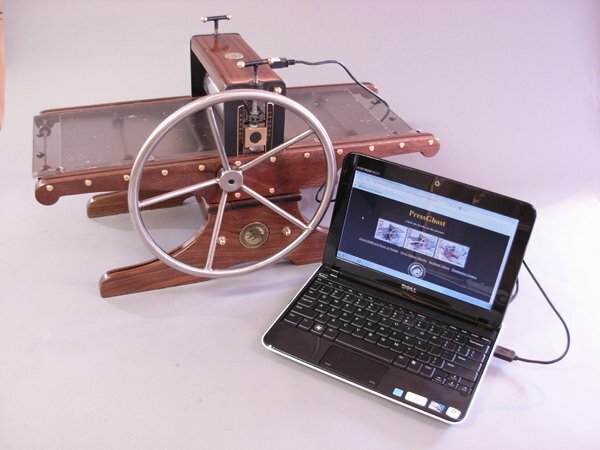 With the support of family, patrons, former students and friends, he designed a small etching press with a loaded flash memory drive in the woodwork—the world’s first “smart” etching press! 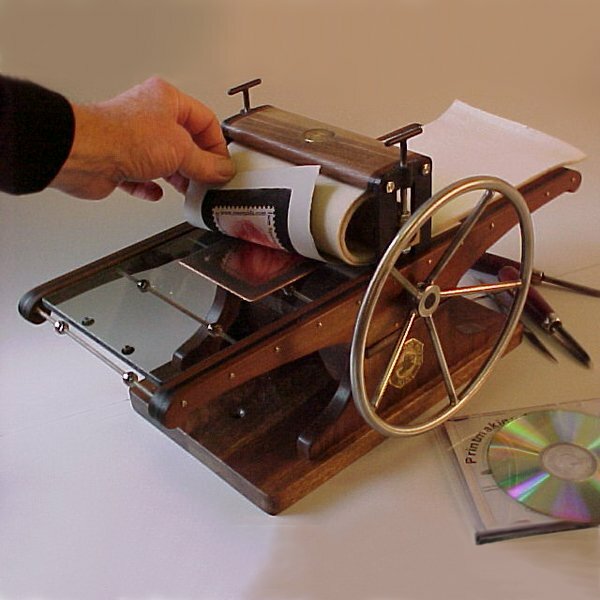 Connected to a computer display, it helps a user to learn printmaking in videos, ebooks and games plus links to the Internet. Learning the balance between hands-on printmaking and digital arts and then to shoehorn his printmaking teaching method into a flash drive took Ritchie many years. 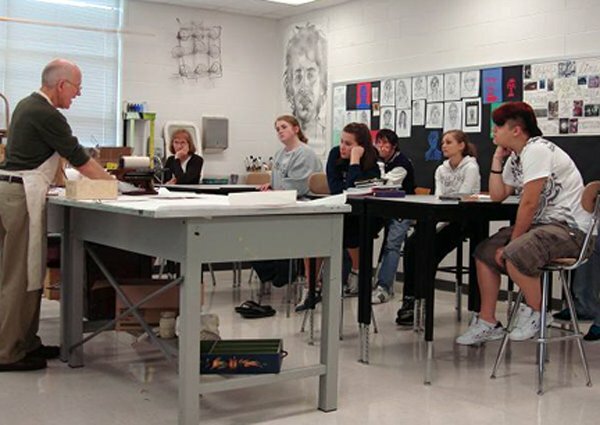 Teaching for 19 years at a research university exposed Ritchie and his students ways to incorporate video and computer graphics to art careers and continuing education. In 1991, the discovery of a prehistoric art treasury was, for Bill, a virtual window upon the origin of printmaking 30,000 years ago. To him the experience redefined printmaking as cave-dwellers had put prints alongside painted images. Bill wondered if they printed their hands in rites, or play, or as a casual gesture—a happening—that caught on. The cave art may have been staging for rituals. Acoustics of caverns must have been great for singing and chanting—the first sound tracks; and hand-prints like the Walk of Fame in Hollywood or Avenue of the Stars in Hong Kong. Printing was a creative act of human ingenuity and faster than painting. 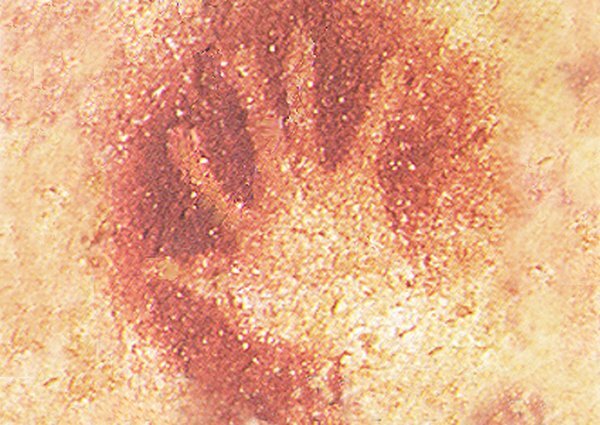 Prints are repeatable—the hand, a ready-made template, would morph into printing plates; and moveable type would morph into computer code. By extension, experiencing printmaking and electronic media as connected suggested that the origins of printmaking—hand prints—were not only visual art but also temporal, performance art. Being structured and repeatable, printmaking is sustainable. Never again did Bill treat printmaking as mechanistic reproduction but rather as the ancestor of games. A trip around the world in 1983 convinced Bill that printmaking and electronic arts could intermix, but his departure from the UW in 1985 forced him to look more into business than academe for resources. It took almost twenty years until conditions were right for the Halfwood Project to begin. In April, 2004, he had the first Halfwood Press built and christened the Century. It is a three-by-six-foot, 300-pound press with a 24-inch wide bed and was built by the Kughler Company in Seattle. Bill clad Kughler’s steel work with mahogany veneer, hand-rubbed the wood to a luster, and added brass embellishments. Bill wanted a beautiful press: “Musicians get to have beautiful instruments—so why not me?” He likened his hand-engraved printing plates to musical scores which he could print with variations, and for this the Century served well. One day in May of ‘04, while admiring the Kughlers’ completed work on the Century Halfwood Press, Bill thought out loud, “A scale model of it would be nice—something I could put on my desktop or mantel.” Kughler took him seriously and quickly produced a miniature, working model—the world’s first Mini Halfwood Press. Bill would learn that the scale model served better than his Century press; the Mini let him take printmaking on the road. He could print anytime, anywhere, which Bill came to consider the social aspect of printmaking art in performance. For Bill the original Mini Halfwood press (now known as the Legacy of the Halfwood line) was his sandbox—a thing with which he could play and try out other ideas. Over time, he added a clock, a music box, and a 10 Gigabyte flash drive into the wooden base, concealed underneath the press’ steel rollers. He gave his press a place in his historical fiction novel, Rembrandt's Ghost in the New Machine, as the Mini Halfwood Press traveled in time with the protagonist to the year 1660 in Amsterdam in an attempt to revive Rembrandt’s etching. For years Bill declared his motto, “Half wood, half steel, all real,” and “Small is Beautiful.” The boxes for printmaker accessories were stamped with the words of the Japanese craftsman/philosopher, Soetsu Yanagi: “Man works best when his tools are in proportion with his task.” The Halfwood Project got noticed online, in demonstrations at art fairs and art stores. Bill brought etching to school kids, too. This startup period was one of performances and was not aimed at business; but when people asked where they could buy one, Ritchie knew that they should make more so Kughler financed a dozen more Minis. Bill tried various woods, hand-finished them and etched brass badges and medallion embellishments. They sold every press—over one-hundred and thirty of them at this writing—to artists and teachers in six countries around the world. As they were now grandparents, Lynda and Bill wanted ways to get children involved in printmaking experiences with Halfwoods. Bill conceived educational and recreational concepts such as Printmaking Camp, Printmaking Roadshow, and Printmaking Parties because printmaking practices develop transferable skills. Artist-owners of Halfwoods who teach and organize workshops found the little press useful for children’s printmaking. 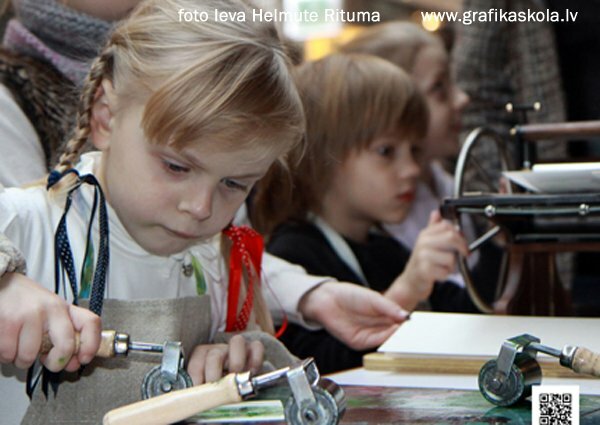 The most active is Ieva Helmute, director of the Grafikaskola in Riga, Latvia. She emails reports and snapshots to the Ritchies from her workshop activities. 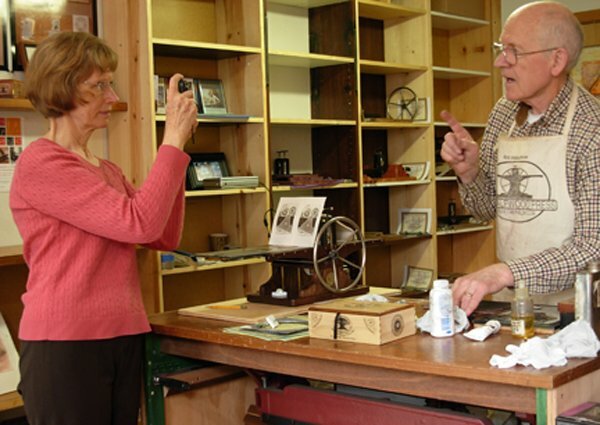 Lynda made videos with Bill as the couple reloaded the family business from the 1970s when Bill made over sixty videos on printmaking and Lynda had an educational videotape distribution business in the home. That ended after Bill left the UW campus and he gave away his analog editing system. Now he’s all digital and makes plans for a virtual printmaking school—a teaching company—to invent and develop a printmaking teaching method. In digitized videos on YouTube, they showcase the Halfwoods in channels HALFWOOD and OMEMERALDA—still online today. Printing presses have, for centuries, been mere utilitarian machines—not designed as “works of art” such as Bill envisioned. Shrinking the press to the size of a shoebox came with the Mini. For centuries, function came first for etching presses while form was bound by mechanical expediency and economics. In contemporary printmaking education, the mid-20th Century notion that Bigger is better was de rigueur as printmaking went head-to-head with painting for a share of the art market boom. In the ‘80s the market cooled and the biggest fine art presses in the US went idle; the major publishers began to downsize. 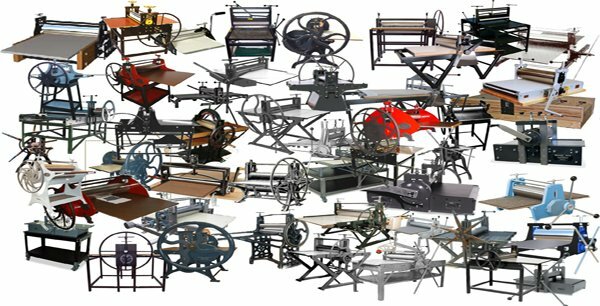 One, Tyler Graphics, sent its out-sized equipment to other countries, and gave to museums collections of unsold large prints by major artists from all over the world. Bill wanted a beautiful instrument, as beauty is typical of musical instruments. As Ritchie had earlier seen ties among printmaking, rituals, and music, this insight gave impetus for him to aim the Halfwood Project toward beautiful, functional design comparable to musical instruments and of a small, personal scale. Presses from the industrial revolution had few aesthetic qualities (except to the engineers who designed them) and institutional, modern presses seem disproportional to Bill. In his design for smaller presses he used domestic black walnut and exotic hardwoods and attached these to Kughler’s steel work with brass screws. Ritchie’s etched-brass medallions create a balance of aesthetic form and functionality. Meanwhile, the small etchings made by old master artists and the moderns continue to be the cornerstone of printmaking experiences beyond the razzle-dazzle of stylish, large scale printmaking. Small is Beautiful reigns in the printmaking world not only for the aesthetics of the intimate size but economically, too. 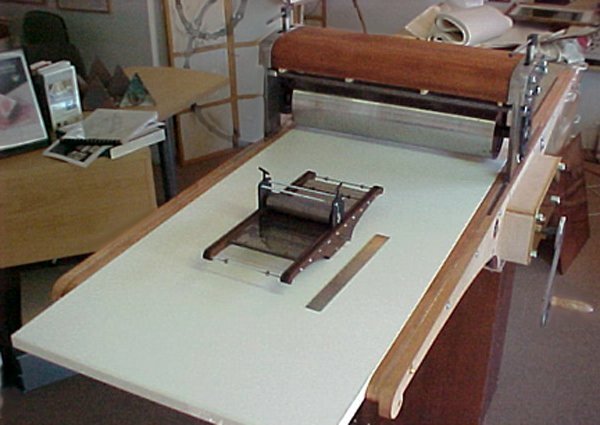 Here is where the Halfwood Line found its niche—a press small enough to keep in peoples’ homes and apartments so that artists and hobbyists, too, are participating in the time-tested, beautiful art and craft of the printmaking tradition shown us by artist’s over the centuries. Printing furniture in the form of a printmaker chest for his Mini Halfwood came next as Bill demonstrated at schools, going by car and once by train. He printed at art fairs, in coffee shops and even on the Kughler’s 34-foot sloop. History repeated itself as it happened with the Mini Halfwood: when the printmaker chest debuted, people wanted one to go with a Halfwood Press. Bill made small, decorated wood boxes for the accessories that printmakers use, e.g., felt blankets for intaglio printing. He adds his paperback book, Halfwood Press: The story—printed in size fitted for the box. 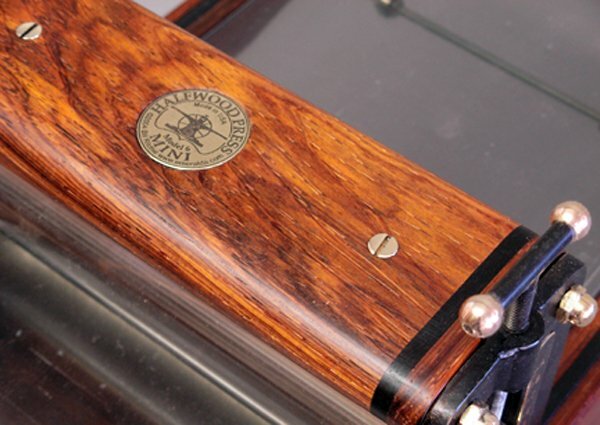 Ron Myhre, a full-time carpenter, was the first to do some of the woodwork on his Halfwood press himself. 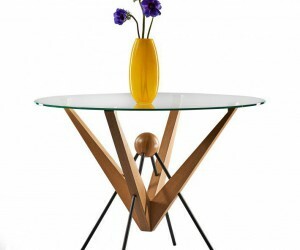 For his press, Ron chose a bronze turning wheel in place of stainless steel, bronze embellishments, and a bronze bed plate in place of polycarbonate. 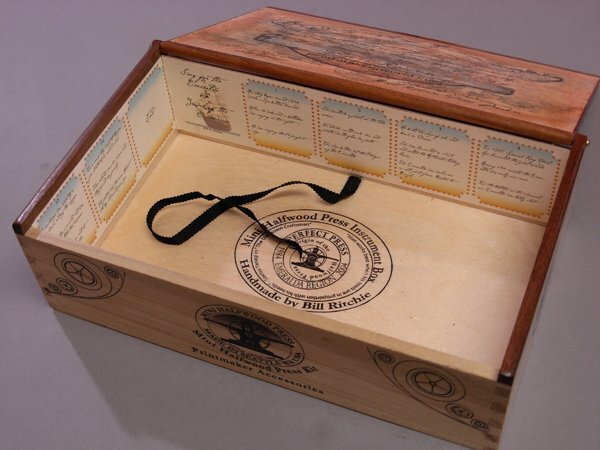 Ron fed Bill ideas, such as a Halfwood Press Kit owners could finish themselves. He came up with a faux-ivory press for the screenplay, Swipe, based on Bill’s legend explaining his Halfwood design. 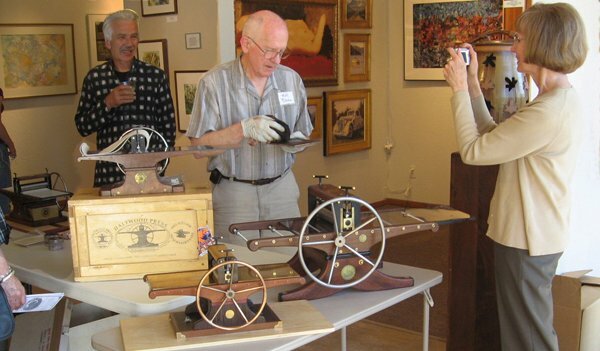 Ron, living in the town of Port Townsend—gateway to the Puget Sound and known as a lively arts and crafts center, he then opened a gallery, Curator’s Eye, to show and sell Halfwood Presses. Warren Ralls, in Surrey, England, saw the Halfwood Press online and corresponded with Bill. At first he was only considering buying one, but also he was thinking about a career change. Why not go all the way? he thought. 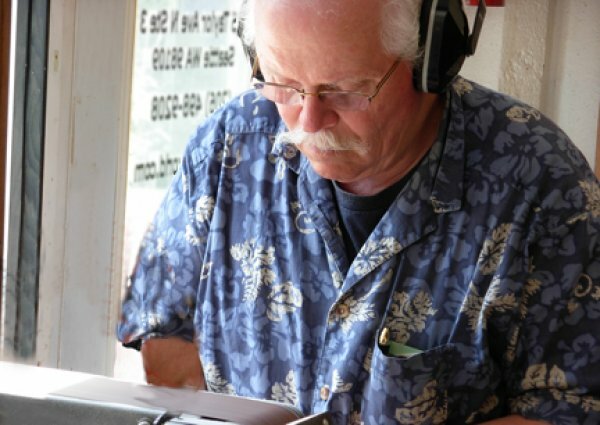 And so, in 2010, Warren flew to Seattle to learn basic Halfwood Press making. 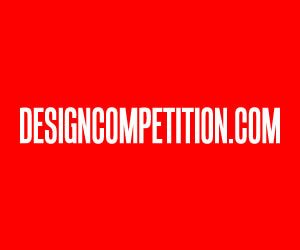 His plan is to draw upon his own art background and his experience in economic development. Bill came to see in Warren’s plan an alternative to importation and taxation costs that kept Bill’s presses out of reach of many Europeans. 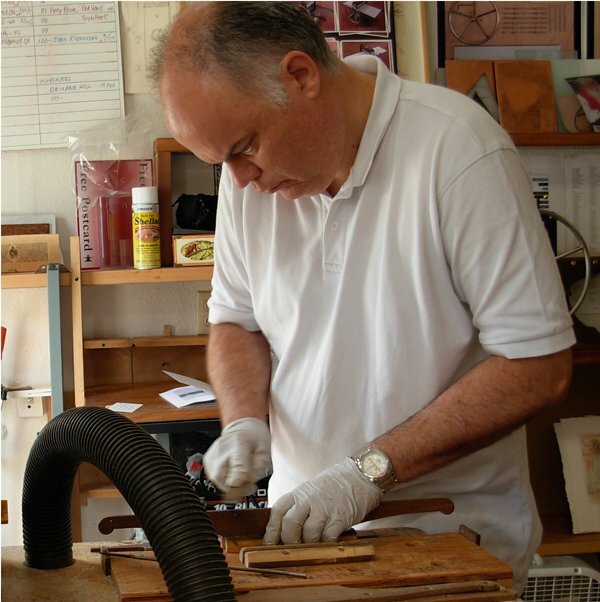 A week in Bill’s Seattle shop gave Warren a start in what he needed and, back to England, he built a shop, a Website and—while he kept his day-jobs going—set about practicing in the English crafts tradition. 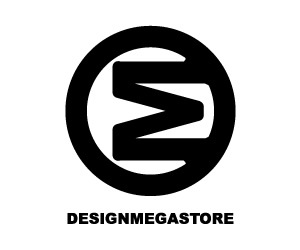 In 2013, after nine years of making Halfwood Etching Presses, the A’Design Award and Competition offered a leveling-up opportunity and Bill entered the Halfwood Project in the Unexpected Design category, in which the team won the Silver Award. The words of the juror’s report state the prize is for: “Form, functional and emotional aspects of the Halfwood Press, the design’s degree of innovation, aesthetic qualities, functionality and usefulness; the ease of realization and realization efficiency, ergonomics and human interaction.” In the photo, a Frigate Halfwood is connected to a notebook for a virtual window into a printmaking world hitherto unknown. Warren Ralls represented the Halfwood Project team and accepted the Silver Award in Como, Italy, in April, 2013. Besides Warren Ralls, the Project Team is Bill and Lynda Ritchie, Tom and Margie Kughler, and Ron Myhre. For more information see www.printmakingworld.com. This article was added on Monday, 27th of January, 2014 at 05.44 am by author Bill Ritchie Tags: etching, printmaking, intaglio printing, Halfwood, flash memory, Seattle, etching press, education. Read our copyright policy here.